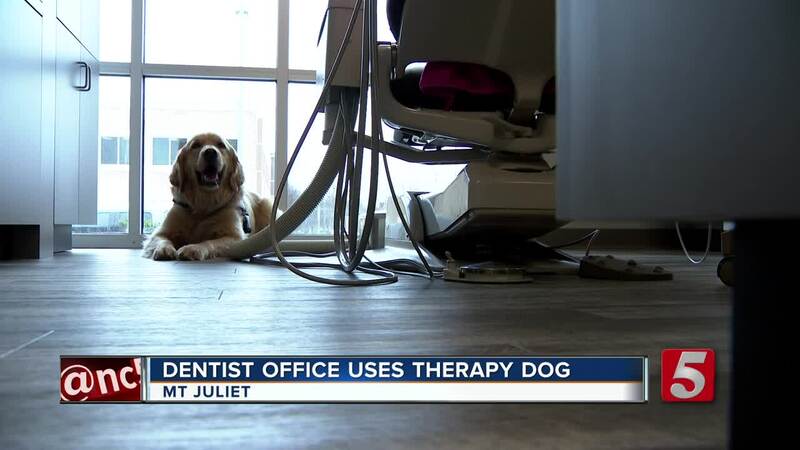 MOUNT JULIET, Tenn. — A Tennessee dentist has found a new way to help people cope with their dental anxiety. Not many are fans of going to the dentist. As many as 20 percent of people won't go because of anxiety and fear, and people with a dental phobia only go when they're in extreme pain. The sound of the drill is just one reason people are scared of the dentist, but there can also be pain and you might feel uncomfortable. “We did sedation and that was fine but I needed something else for the patients in the waiting room something else to calm their nerves,” said Dr. Mike Glasmeier. And Mack is that something else. He’s a 2-year-old golden retriever from Retrieving Independence in Brentwood, Tennessee. Mack is now a service dog turned therapy dog for Generations Dental Arts in Mt. Juliet. Glasmeier calls him an anxiety inspector. Glasmeier and his wife have children with special needs – that’s how they got the idea for Mack. Now, a large group of their patients are children with special needs and adults who sometimes can't express how they feel, but Mack knows. And just like the dentist, Mack does his rounds — and is just the right prescription every single time.